The past week and a half has been a ride, and this fish en papillote (steamed in parchment) has been my saving grace. Eleven days ago, I went through a server migration for this blog. I wish I could say the transition was smooth, but it wasn’t. It was nightmarish. As if all of that computer-y techy stuff wasn’t bad enough, eleven days ago was also when I kickstarted my Elimination Diet in an attempt to try and sort out a possible food sensitivity. I haven’t been eating nuts, grains (rice, quinoa, etc. ), legumes or beans, nightshades (tomatoes, eggplant, potatoes or peppers of any sort), citrus, dairy, eggs, soy, wheat or gluten and, much to my chagrin, no coffee. *collar tug* So basically, throughout all of that stress, I couldn’t even turn to pizza or beer to ease the pain. Fact: carrot sticks don’t ease the pain. I did however manage to survive, and I’m happy to report that I feel better than ever. Also, in a fit of desperation one evening while feeling deprived of ingredients, I created this Mediterranean Fish en Papillote, and I’ve had it three times in the last 11 days. Fish steamed in parchment is just SO. DAMN. EASY. If you like fish, you need this; if you aren’t crazy about fish, this might be a turning point. En papillote is French for “in parchment”. This method of cooking is deceiving because though it looks and sounds fancy, it’s a cinch to put together. The parcel of parchment is sealed by overlapping folds around the fillet (video below). I love roasted or grilled fish, but steaming fish in parchment paper is a whole new level of awesome that needs to be indulged once in a while. When you bake the fish, it steams to a perfect flakiness while sitting in the juices of whatever you add to the packet locking in flavor and moisture. The fun part is you’re given free rein, so you can keep it simple or make it as complex as you want. It’s common to steam fish alongside lemon slices, fresh herbs and a splash of wine; I’d like to experiment with beer this summer. The possibilities are endless and the process is fuss-free; dishes like this deserve the highest of fives. The best way to serve these bad boys is to keep them sealed so that each individual gets to tear their parcel open at the table, like a little gift, and enjoy the aroma that releases from the pouch. This is a fab idea if you’re hosting a dinner party. Here’s another variation that I love, with soy and ginger! This Mediterranean Fish en Papillote is quite literally *packed* with flavor. 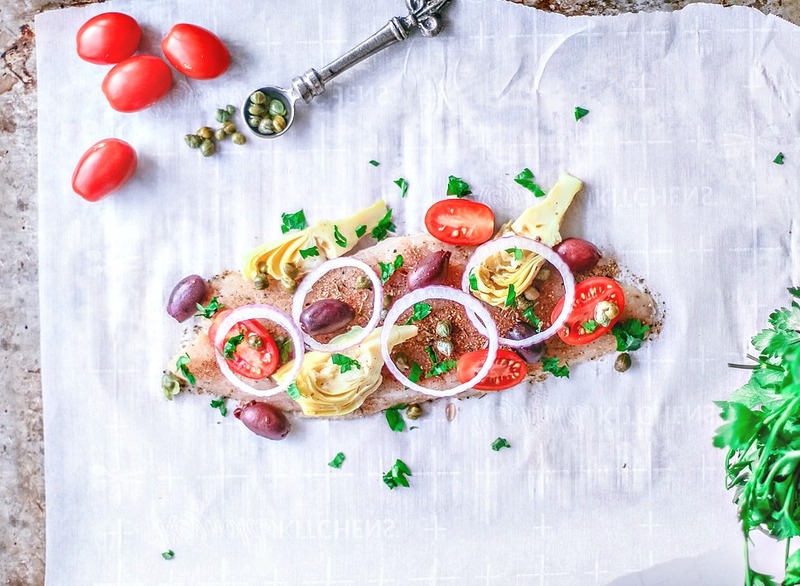 Sealed up in parchment paper with briny olives and marinated artichokes, this cod is steamed to perfection. Parchment Packet Method #1: Folded Pouch. Place each fish fillet on one side of each segment of parchment. Sprinkle each fillet with the dry rub. Use as much or as little as you prefer. You can store any leftovers for another time. I tend to sprinkle each fillet with 1 - 2 teaspoons of the seasoning. Arrange the olives, artichokes, onions and capers over the fillets. Drizzle 1 tablespoon of olive oil over each fillet. Brush the edges of each paper with the egg wash (optional) for a tighter seal. Fold the parchment paper over the fillet to close it in and press the edges down. Begin to tightly fold the open edge of the paper on one end and, inch by inch, continue to fold around the fillet. Parchment Packet Method #2: Tied Pouch. Place each fish fillet in the center of each piece of parchment. Sprinkle each fillet with the dry rub. Use as much or as little as you prefer. I tend to sprinkle each fillet with 1 - 2 teaspoons of the seasoning. Transfer the packets to a baking sheet and bake in the oven for 12 minutes, or until the fillets are opaque, flake easily, and reach an internal temperature of 145° F.
When done, remove from oven and transfer packets to plate. Allow people to open their own packets to experience the steam and aroma that emerges from the pouch. mmm this fish looks very tasty! This is an ideal dinner for me and my family. I really like. I definitely want to try this! Thank you for sharing this great recipe! Yaaaaassss! My husband would be all over this seafood dish! I love cooking fish in parchment. The flavor profile in your recipe looks amazing! I can’t wait to try this! When food meets art and makes me want to immediately go out and buy all the ingredients in the process. Just wow. Looks incredible!! I admire your creativity here Dana. That many food restrictions does NOT make for an easy bit of recipe development, and you've pulled off a dandy here. I love en papillotte cooking, and it's so perfectly suited to fish - I tend to do something with white fish and white wine myself. Of course if you can't have booze (booooo-s) you have to rethink that old classic. Kudos on surviving the combined headaches of the last two weeks, and for making something wonderful out of it. Love the look of the site now, and best of luck with all future hosting and thematic tweaks. Thanks, Sean! It was tough, but luckily I managed. White wine works wonderfully too; my problem is I never want to give up any of the wine for cooking, lol. But yeah. I'm so glad that things are going more smoothly now. I'm glad you like the site! Thanks! I'm really happy with it. It's a fresh and clean theme that works really well. Cooking in parchment is such a great way to cook fish. I think the reason some people don't like fish is because they've had it improperly cooked. It's so easy to overcook white fish. I LOVE your flavour combinations in this recipe. I think this would be great with halibut too. Thanks! To open a papillote is as satisfying as cracking through the top of a creme brulée! Especially when it's well seasoned like you did! Great trick with the seal of egg wash, I'll try it out next time I cook en papillote! Lovely recipe! Transferring your site is never easy, but always worth it! I've been there! The new site looks great, and that fish looks amazing!